Our main aim is to provide a broad and balanced curriculum which has Christian values as its foundation. Our shine curriculum is designed to enable children to ‘shine’ in a broad range of ways to ensure a whole hearted educational experience. We lift the lid on learning and opportunities, there are no limits which enable children to thrive and excel. Provide an excellent standard of education for all children. Develop children to become independent, reflective learners who have a sense of responsibility for their own learning and development. Enable children to use their acquired skills and knowledge to observe and question. Provide children with challenge which they can independently initiate. Inspire confident and motivated children. Provide responsibility of our pupils and develop leaders for the future. Care for the well-being of our pupils and staff. Keep our children safe and empower them with the skills to do this for themselves beyond school. Nurture children who understand the importance of perseverance, resilience and tolerance and embed values for life. Embed skills to prepare children for further learning and transition to their next stages in education. At Ashton Keynes C of E Primary School we bring the National Curriculum alive through a Learning Challenge Curriculum, which promotes enquiry-based learning through a skills-based curriculum. To download our skills progression documents for each subject and each year, please click the appropriate link below. These document shows the progression of skills that children should learn in each year group and in each area. Our shine Curriculum delivers the National Curriculum 2014 and beyond. It is designed to be exciting for children and staff with stimulating topics which the children become fully absorbed in using a cross-curricular approach. It enriches our children as learners and leaders for the future, offering them unique, bespoke opportunities over their 7 year primary journey and preparing them for the future. Daily teaching of Maths and English along with the rehearsal and application of basic skills learned in the core curriculum is a driving force for the entire curriculum. When required, extra support is provided beyond the Curriculum through trained staff who provide speech and language therapy, Emotional Literacy support, Narrative Therapy, the Boosting Reading Programme, Turnaround Phonics programme alongside many other impact driven interventions. Our staff have a wealth of experience and knowledge and lessons are alive with challenge and involvement for all. 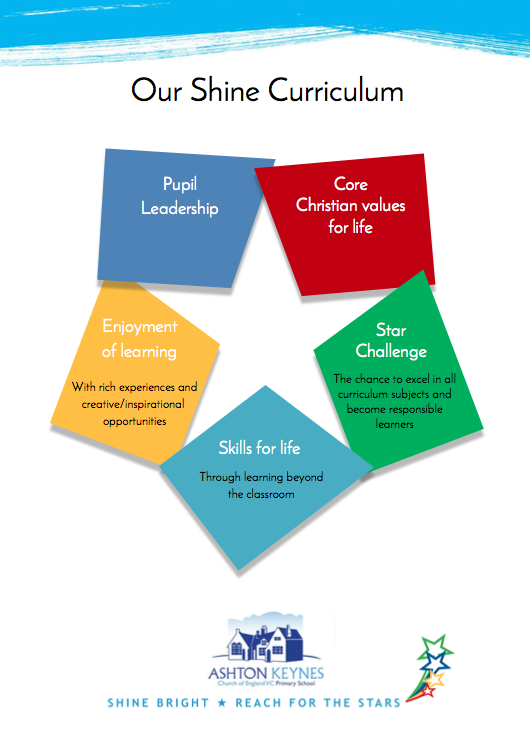 As a Church of England school we have identified a core set of values and teach living values. We work very closely with Holy Cross Church which is an extended part of our school family. Beyond the National Curriculum, we offer a very bespoke range of activities and opportunities to develop well rounded, happy and confident individuals. Pupil Leadership– children in our school are given progressive responsibilities, all children have the opportunity to develop their leadership skills. We actively encourage children to lead and to initiate leadership and responsibility across the school. Pupil voice is essential and strong within Team AK. We have a very active democratically elected school council who run their own successful business, a very established worship council and an eco-council. In addition we have many examples of pupil leadership including: reading and library leaders; outdoor reflection leaders; IT leaders; sports leaders and lunchtime leaders. At lunchtimes, our children run our school office for 30 minutes daily as a development of a wide range of pupil responsibility available within the school. On visiting our school, our children will be delighted to tell you about their leadership roles and are regularly initiating further opportunities to lead to further develop themselves and the school. Star Challenge- we use the star challenge to lift the lid on learning. In every lesson, the children have the opportunity to ‘reach for the stars’ and decide on the level of learning right for them for that particular lesson. We model and scaffold the children as learners so that they are able to know how to make the right choices for them to ensure they have the chance to excel. We do not have ability groups, instead the level of star indicates the level of learning the child takes per lesson, there is the opportunity to attempt more than one star, to explore greater depth and to be supported to achieve a star. Children will tell you how they make their choices and enjoy challenging themselves, there are no limits on their learning. Star challenge happens in every lesson, every subject and in home-learning from EYFS to Year 6.
we inclusively and actively promote Christian values in our school. Our worship council identified 4 core values which our school are known for: friendship, creativity, perseverance and trust. We have a wall of stars on which children demonstrating these values in their daily life inside or outside school can shine. We look for the impact of the teaching of Christian values upon children and staff in their daily lives. Upon visiting the school, visitors comment on the positive impact of the values upon the ethos of the school and it is clearly evident within the strong relationships between pupils, staff, parents and the community of our school. Skills for life- At AKPS we offer a bespoke enrichment programme for each year group to ensure they experience and develop a range of skills for life including: business challenges using their entrepreneurial skills to fundraise for charity; links with the local community; taking part in democratic Mock Trial competitions; attending residential trips which further develop team building or explore life in modern Britain; weekly outdoor forest schools learning; regular cooking with ‘kitchen club’; writing competitions; visiting authors to inspire; opportunities to write and publish books; a successful and established whole school buddy system; high quality specialist music lessons and instrumental opportunities; specialist French teaching; dedicated book study groups; regular mindfulness sessions for pupils and staff and the Massage in Schools programme for pupil well-being; a choir performing in concerts and shows and annual special weeks such as World Awareness and Sports weeks. In addition to our wide range of extra-curricular activities to extend learning beyond the school day, all children and staff partake in regular Zumba for kids sessions. Safety first– Children are taught essential skills to keep themselves safe. Throughout the school we offer thorough programmes of internet/e-safety, NSPCC PANTS safety, anti-bullying sessions, fire and water safety, stranger danger. We regularly invite outside agencies in to talk to or work with our pupils including: the police, fire service, air ambulance, NSPCC, the life education centre. Children work together to write our anti-bullying and e-safety policies in a relevant child appropriate format. Through forest schools children are taught safety skills regarding fires, countryside safety and to do their own risk assessments. Sports/PE- We teach our children the importance of keeping themselves healthy, active and making the right choices. Our annual sports week provides sport in a diverse way to aim to involve as many pupils as possible in activity. Some sports we offer include: wheelchair basket ball, archery, table tennis, golf, Zumba, visits from inspirational speakers such as Olympians or individuals who have challenged themselves against all odds to achieve in sport. Weekly we have a qualified sports coach who trains our staff and teaches PE at our school from year one onwards. PE sessions are based upon our star challenge approach with children all participating in regular high quality exercise and sport/PE skill development leading to competitive team game participation. Our children receive high quality PE provision and regularly compete against other schools (See sports section). There are a wide range of sports cubs on offer for all age children (see club list) as well as opportunities to represent the school in a range of sporting teams including: football, netball, dance, rounders, tag rugby, cross country, district sports and sports hall athletics. Enjoyment of learning- We use a number of different approaches to explore and deliver the topics to ensure we enable our children to develop all the skills they need to be confident and successful learners. Our children are involved in the planning stage of new topics as we value their ideas and contributions; we believe that children learn best when they are able to steer and direct their own learning. We want our children to be inquisitive and passionate about their learning and spark a life-long desire. We want our children to be challenged and to be independent learners, making the right choices about their learning, understanding the need to take risks and to learn from their mistakes. We have a special star challenge system which is used across the school to provide all of our children with challenge in every area of the curriculum. We aim to engage our children in their learning with special WOW days. These could be immersing them in a Greek experience day, a Viking visiting the school, a volcanic explosion, the arrival of dinosaur eggs, a mystery to solve or an educational excursion. We work in class teams, with year groups joining together to explore their learning fully and give children the opportunity to work with peers and teachers from another class. Our home learning is also linked to these themes and uses the star challenge to differentiate tasks so that they are at suitable for all children along with offering a challenge. We believe in ‘learning for life’ and whilst this cannot always be seen in the children’s books; we capture this in our special class learning journeys for all to see and share. Each class creates a learning journey to showcase the curriculum in action through their learning, this is beneficial for visitors to the school to see, for children and parents looking ahead to the next year group and for the children in the class to feel proud of showcasing their work. On our website, each class displays their annual overview on their ‘class pages’ (see tab on home page) to show our shine curriculum in action. Interwoven throughout our Curriculum is our British Values Education and SMSC (Spiritual, Moral, Social and Cultural) development of our children. Our weekly ‘time to shine’ worship ensures we celebrate all of our children for shining brightly both inside and outside school. We have a wide range of merits available to ensure there are no limits on our children and how they shine. At the end of every term (6 times per year), parents and carers are invited in to share in these assemblies ‘Heroes and Heroines’ a chance to celebrate our children together. In addition, parents and carers are invited to class assemblies and special visits into school to see our shine curriculum in action. We aim to keep our parents and carers well informed and excellent communication is essential. When necessary we offer parent workshops to support our parents with home-learning to ensure our children get a well-rounded package of support and further develop our important home-school partnership. This is particularly supportive if there has been a change in the approach to teaching or curriculum or assessment changes made by the Government. We have recently offered ‘Keeping up with the kids’ English and Maths changes and Year R phonics and reading meetings, Year 2 and year 6 meetings and mindfulness for parents and carers. Residentials – We organise special school journeys to further enhance out children’s learning and give them further opportunities to shine. 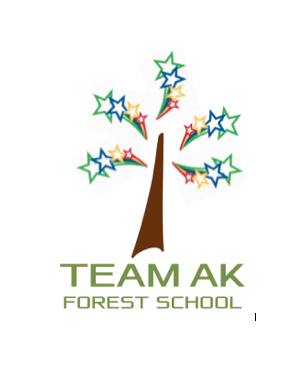 Year 4 – Forest school over night camp in AKPS grounds. Year 5 – Forest school and outdoor adventure activities with 2 nights camping in the Forest of Dean. Year 6 – ‘Life in modern Britain’ visit to our capital city London for an exciting culture and adventure packed 3 nights.